Soil salinity and drought are major stresses that limit crop growth and production. In recent years, these effects have become more alarming because of forthcoming climate changes. Overproduction of reactive oxygen species (ROS) causes oxidative stress in plants. To combat the situation, scientists have made significant progress in varietal improvement, as well as in understanding the tolerance mechanism. Being a C4 crop, maize is thought to be comparatively less affected by ROS, which comprise singlet oxygen (1O2), superoxide (O2•−), hydrogen peroxide (H2O2), perhydroxy radicals (HO2•), and alkoxy radicals (RO•). Plants possess their own internal enzymatic and nonenzymatic antioxidants to keep the damage down by regulating ROS. Enzymatic antioxidants include superoxide dismutase (SOD), peroxide (POD), catalase (CAT), ascorbate peroxidase (APX), glutathione peroxidase (GPX), glutathione S-transferase (GST), dehydroascorbate reductase (DHAR), and monodehydroascorbate reductase (MDHAR). On the other hand, methylglyoxal (MG), a potential cytotoxic component, is produced as a result of enzymatic and nonenzymatic pathways in a plant cell. These must be detoxified/declined for cellular survival. Two enzymes—glyoxalase I (Gly I) and glyoxalase ll (Gly II)—are important for MG detoxification. 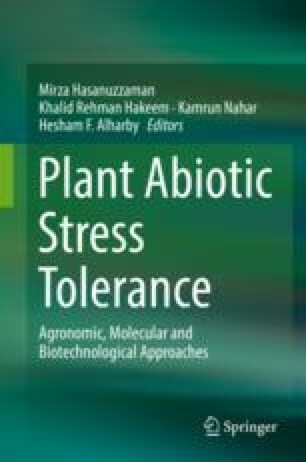 In this chapter, we review and discuss the present circumstances of maize production and recent progress in varietal improvement for drought and salt tolerance, emphasizing how ROS and MG are regulated in a plant cell by the antioxidant defense and glyoxalase pathways. We also focus on recent approaches to attenuation of oxidative stress in maize plants grown under salinity and drought conditions. The authors acknowledged the research grant of Sub-project CRG-389, NATP-2 for SOD and APX isozymes analyses.